The Kitchen has a uniquely shaped island with a drop-in down draft stove. Across the hall is a huge walk-in pantry with a freezer and lots of shelving. The Great Room has an optional Gas Fireplace and optional recessed 10’ ceiling. The Master Suite has an enormous walk-in closet and access to Porch 2 through French doors. The Master Bath has a separate whirlpool tub, custom shower, and toilet compartment for privacy. All Bedrooms have walk-in closets. Bathroom 2 is located with easy access to all three bedrooms and a vanity area, perfect for multiple children. There are 2 fabulous porches. Porch #1 is huge and wraps around to the right. 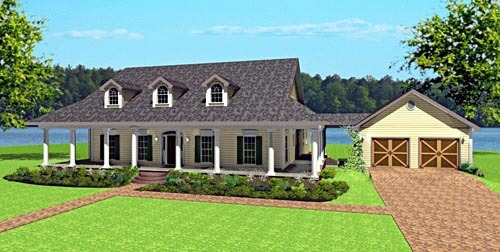 Porch #2 has a deep 14’ covered porch with a 7' deep porch located on the Master Bedroom wing. There is a breezeway that leads to a nice size 2 car garage... build it now or later. Answer: We have some similar with 3 bedrooms and here the plan numbers are 64519, 64535 and 64579.